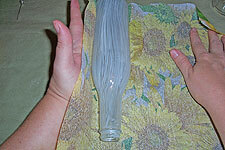 I have a thing for clear glass bottles—such a serious thing for them that they tend to take over my workroom. 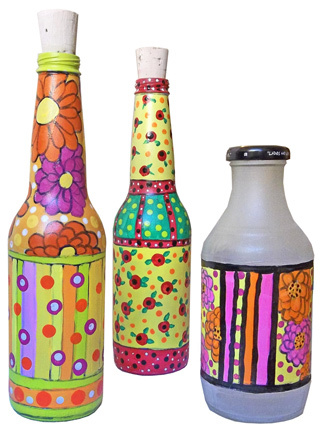 When I was offered the opportunity to do an altered bottle swap, I jumped on it, hoping I could clear out some of the bottle overpopulation. 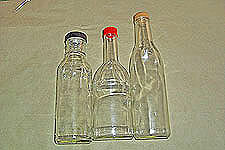 I started with plain old glass bottles that had been cleaned inside and out. 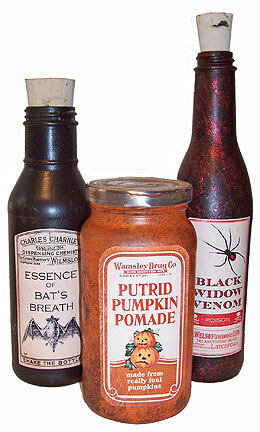 The group of bottles shown here came from salad dressing, hot sauce and marinades. Given a choice between food products in glass and those in plastic, I generally choose the glass—I know I’ll put the container to good use later. 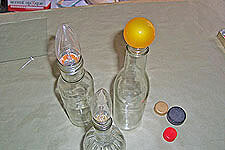 After the labels were removed with a little Goo-Gone, the one thing I disliked about the bottles was their plastic lids. I replaced them with small lightbulbs in fun shapes. I look for these on clearance after Christmas, and also pick them up at the local dollar stores. 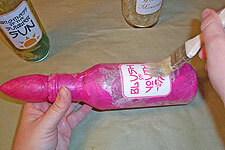 I decided to decoupage the first bottle with decorative napkins. 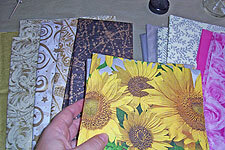 I had some sunflower napkins from Target’s clearance aisle that I thought would make a nice background. 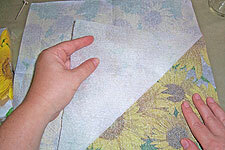 I began by unfolding a napkin, laying it printed side down, and peeling away all the white layers behind it. 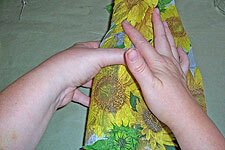 This leaves just the single printed layer, which is a little fragile, and requires some gentle handling. 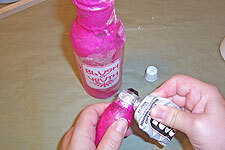 To apply the napkin to the bottle, I coated the exterior of the bottle with some matte medium, then placed the bottle onto the napkin. 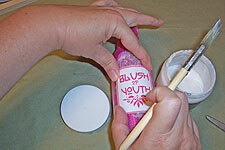 Working quickly, I rolled one side of the napkin over the wet bottle, pressing it gently into the medium. 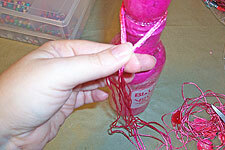 Then I rolled the other side over the bottle, tearing away the excess. 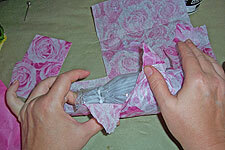 The napkin becomes very fragile when wet, and tears easily, so try not to handle it too much. 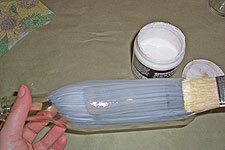 I applied some extra medium to the bottle where the napkin overlapped. 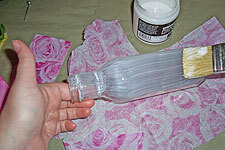 I also applied a bit to the bottom of the bottle, and the inside of the neck, and folded the top and bottom of the napkin into it. 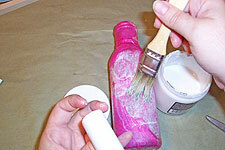 The whole thing was set aside to dry, and then coated on the outside with medium. 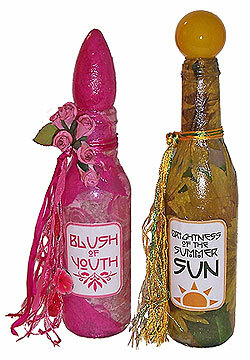 I decoupaged the second bottle with wrapping tissue. I found a pack at the dollar store that contatined magenta rose print and solid papers, and decided to work with both of them on this bottle. 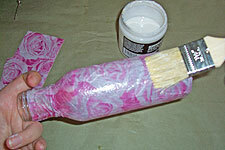 I started the same way I did with the napkin, by coating the bottle with medium, then rolling the paper around the wet bottle. 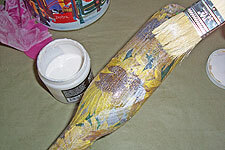 I let the bottle dry for just a few minutes, then gave it another coat of medium, and applied torn pieces of the solid paper here and there. 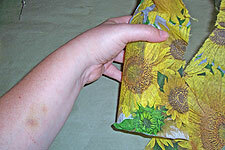 The tissue is a little sturdier than the napkin was, so I was able to work on it while still wet. 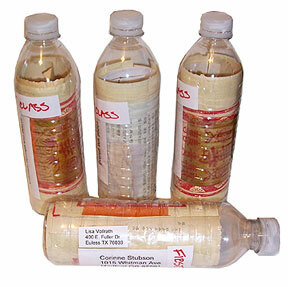 I printed some labels using my computer and laser printer, and applied them to the fronts of the bottles with medium. A coat on the back, and then one on the front held them in place without rippling. 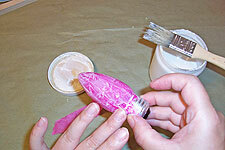 I finished the stopper for the pink bottle by coating a lightbulb with medium, and layering small pieces of pink tissue over it. 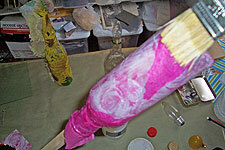 When the stopper was dry, I glued it in place with E6000. 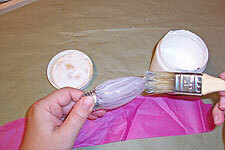 I sealed both bottles with two coats of Diamond Glaze. 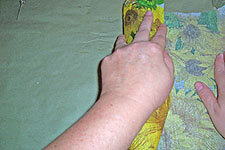 The glaze dries pretty hard, so it will protect the papers from being damaged over time. 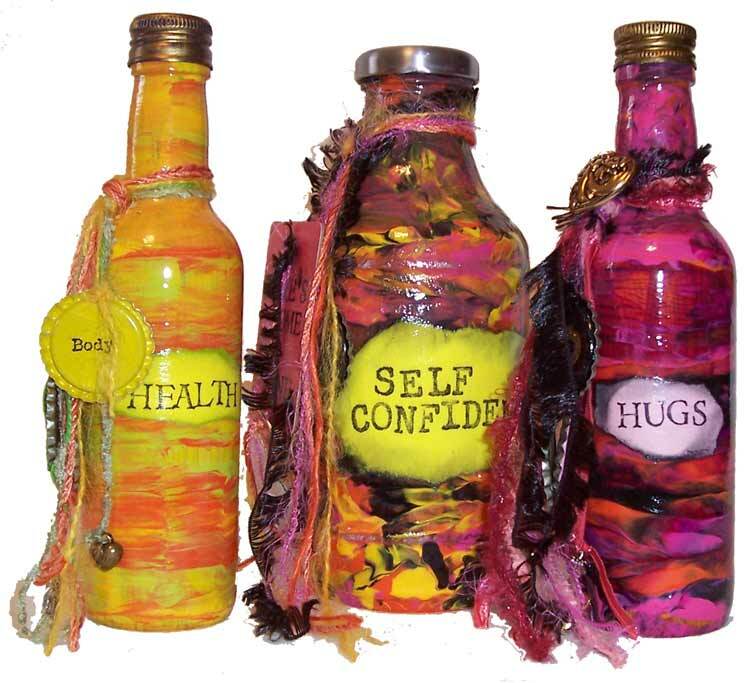 To finish the bottles, I tied fibers around the necks, and tied charms, keys, and beads into them.